Every displaced person has own story. Some were able to adapt themselves to new circumstances and start a new life in a big city, while others continue to live by the hope to come back home. 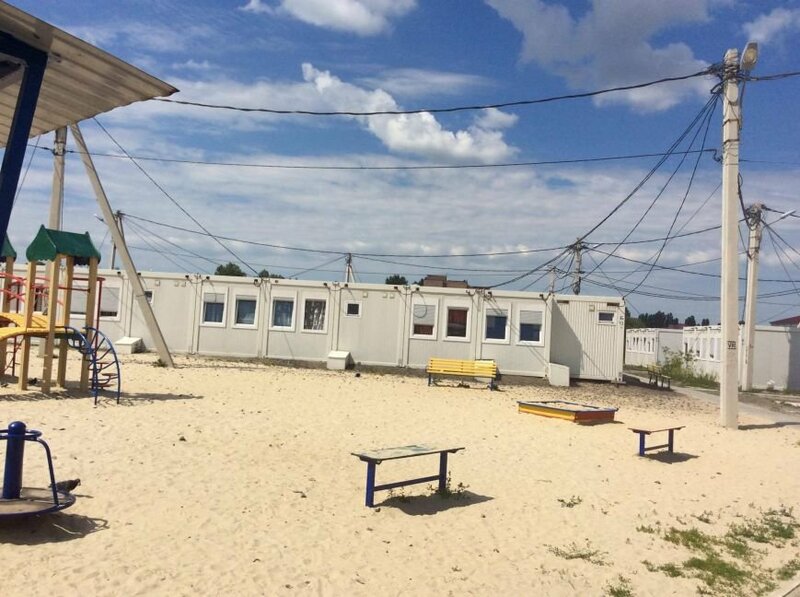 A modular village in Kharkiv became one of the refuges for displaced people. This is the place which three years ago was built as a transit point. It was thought that IDPs would temporarily stay there until they find a permanent place to live. Time went by, but not all of them were able to change their lives. 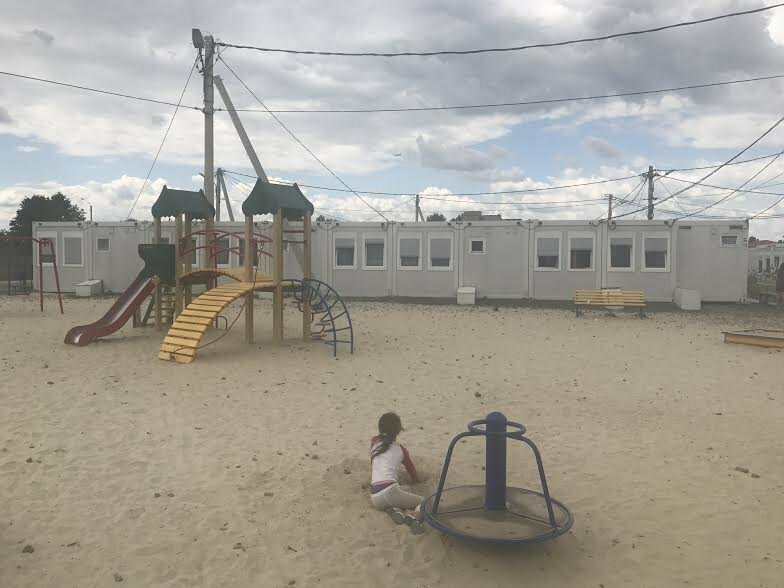 Among the modular village’s residents were IDPs from Lebedynske and Vodiane, two villages located in the immediate proximity to Mariupol. Both of them are controlled by government forces, but the rebels are shelling the villages on an almost daily basis. Houses are destroyed, and the problems with water and power supply are constant. 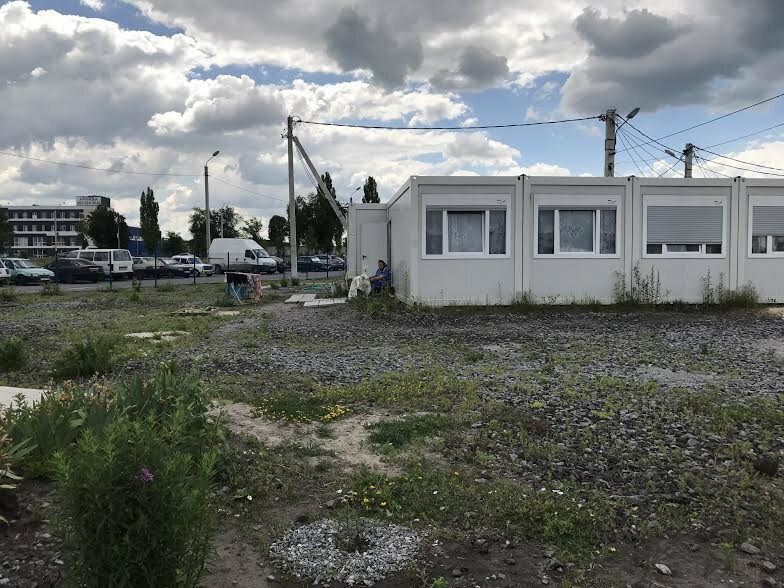 An IDP from Lebedynske, Iryna (the woman’s name was changed at her request – editor’s note) has been living in the modular village for over two years. The woman lives in a house with her husband and three children. The youngest boy, Yura is 3, and the two girls are attending school. “We were invited to Kharkiv by friends who rented a house on Kholodna Hora. Everything was fine, but staying long in a house with seven children in total was impossible,” Iryna recalls. Her family was offered two rooms in a modular village. Naturally, the IDPs agreed, especially since the rent for the house was more than modest, about 100 hryvnias per person per month. So, two years went by… Iryna’s husband found a job. He works as a tractor driver, just like in their native Lebedynske. His wife stays home, looking after their house and children. Iryna is happy with life in a modular village. “Our accommodation here is good,” the IDP says. “We have hot water and electricity”. Iryna complains that the containers heat up in the sun, and it becomes very hot inside them in summertime, but in winter, they are not cold. During the time of the modular village’s existence, the rent there went up on numerous occasions. 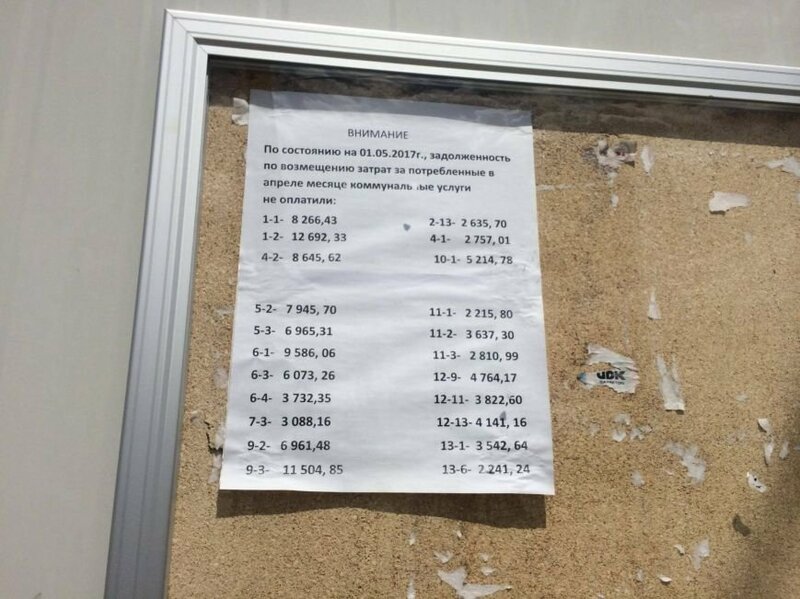 Since February 2017, IDPs have to pay 1800 hryvnias for a room in a dormitory, while a house like Iryna’s costs 3300-3400 hryvnias to rent. The family from Lebedynske still can afford a rent like that. Besides the husband’s salary, they receive 2400 hryvnias in compensation from the state for the lost housing. Iryna wants to start looking for a job soon, but before that, she wants to rent an apartment. “You have to understand, this is the third year we have been living in these conditions… We want to have something of our own. We want to leave,” Iryna says. For the family of IDPs, it is very important that their apartment is located next to the modular village, because the children are already used to the local school and the parents would not want to traumatize the girls by moving to another place. However, the purposeful people like Iryna are not that many in the modular village. As an IDP from Yenakiieve told our journalist, finding a job in Kharkiv is very difficult. “We live here like in a can, and nobody wants to help us,” the man says. The man is sure that normal life for him is possible only in his native Yenakiieve, to which he cannot return because of his political beliefs. Among the residents of the modular village, there are many single mothers with many children. That’s the reason why they cannot go anywhere, and besides, they have long become used to a life in the conditions like that. 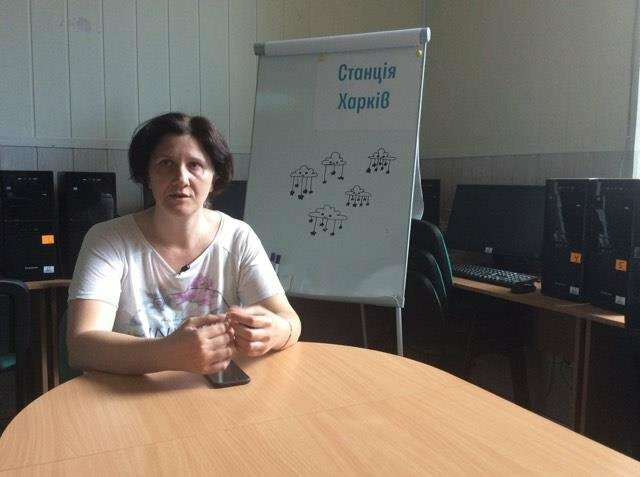 An IDP from Stanytsia Luhanska, Alla Natarova has even found a job in the modular village. Alla works as a cleaning lady, and very happy about that. Her kids are not left unsupervised, and some money keep trickling in. In total, there are 389 persons, 34 veterans and disabled, and 178 children (including 17 disabled) living in the modular village. The largest family in the village consists of 17 people who live in three modules connected to each other. Among the modular village’s amenities are laundries, sports grounds, a medical office, Internet access… Some residents have air conditioners. There are security guards on duty at the entrance, and the premise is under video surveillance. Doctors, psychologists, representatives of civic organizations regularly visit the IDPs. 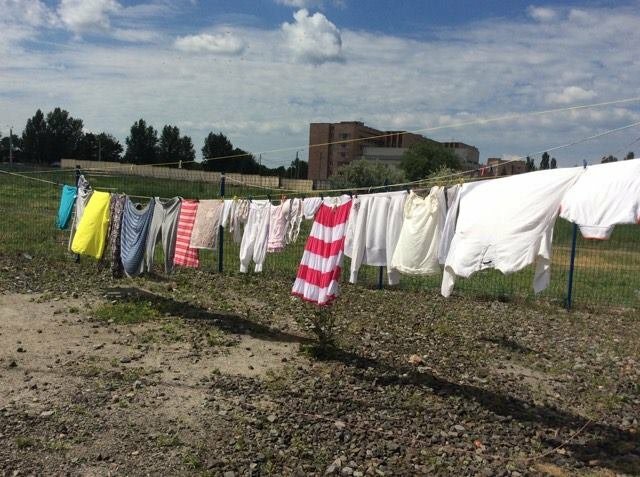 Ordinary Kharkovites do not forget about the IDPs, either, bringing them clothes and footwear. According to the IDP Iryna, relationships among the modular village’s residents are friendly; the IDPs tend to cooperate and help each other, although quarrels and jealous gossips do happen. “You can trust in some, make friends with some. People are different, of course; they judge by your traits, by your deeds,” the woman says. Artur Statsenko, the head of the modular village’s maintenance department was not particularly welcoming to journalists. He said that visitors coming to the modular village are “too many”, and at first, wanted to bar us from talking to the IDPs, claiming that “people are tired of cameras”. After numerous arguments, Artur Statsenko led a tour of the village, showed the location of main facilities and tried to control every move of the correspondents. The commandant did not let us enter the houses and prohibited us from filming him. Artur Statsenko has been in his office for only three months, and leaves the impression of a confident and ambitious young manager. Speaking about incidents occurring in the modular village, the commandant stressed that he tries to prevent them, but things happen. For instance, Artur denied accommodation to a man with numerous convictions. “How could I let him live next to kids? I would’ve had a riot here!” he says. 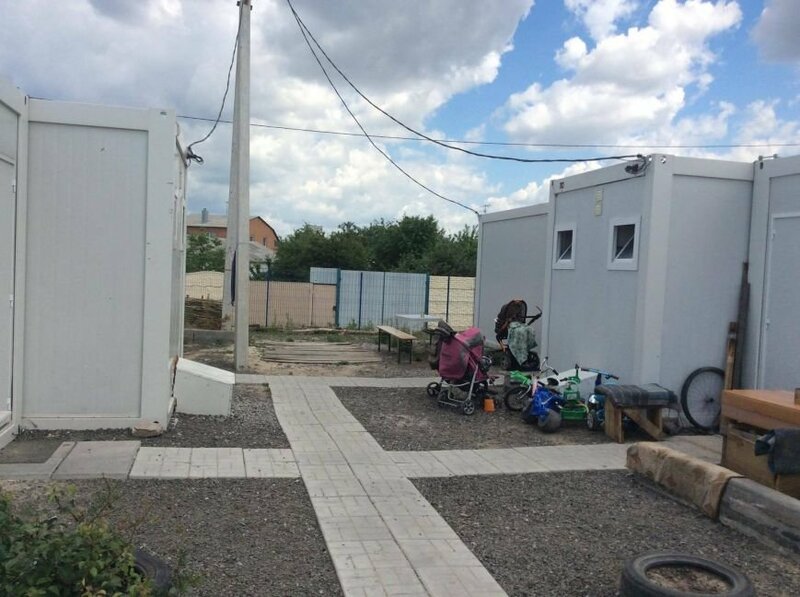 The commandant says that these houses are similar to those in which immigrants in Germany live, with the only difference is that in Germany, they have three stories. 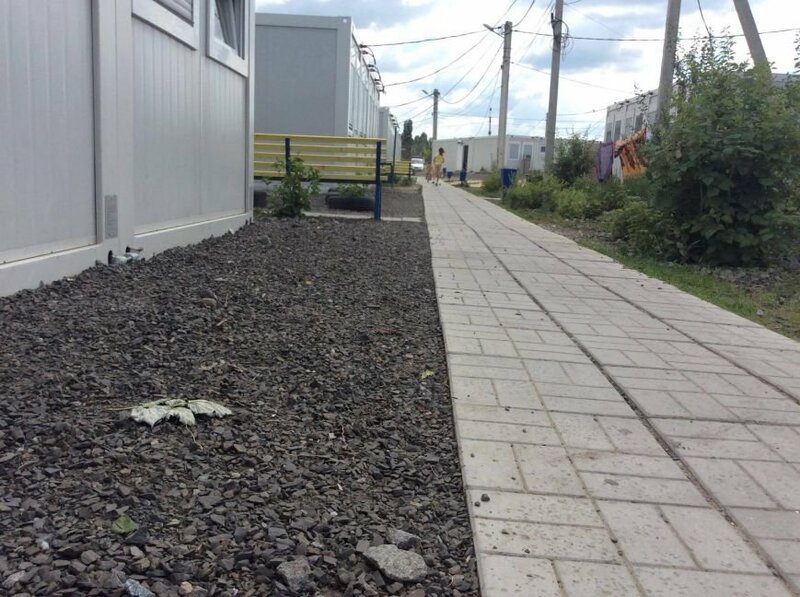 According to Artur Statsenko, escalation of fighting does not lead to the increasing number of IDPs in the modular village, or to the “new waves” of those in need in general. The people who live here are mostly those who came three years ago, or those resettled from other social dormitories. “The most important thing is to live in peace and order. That’s the law of life,” Artur Statsenko sums up. Yulia Konotoptseva, the chair of the board of Station Kharkiv volunteer center has own opinion regarding the modular village. She says that representatives of this organization stood at the origins of the village and participated in the commission allocating rooms. Today, the modular village has transformed from a transit point into a permanent human settlement, which happened contrary to the original concept and created a lot of problems. “A modular village the way we see it today is a bad idea,” she says. 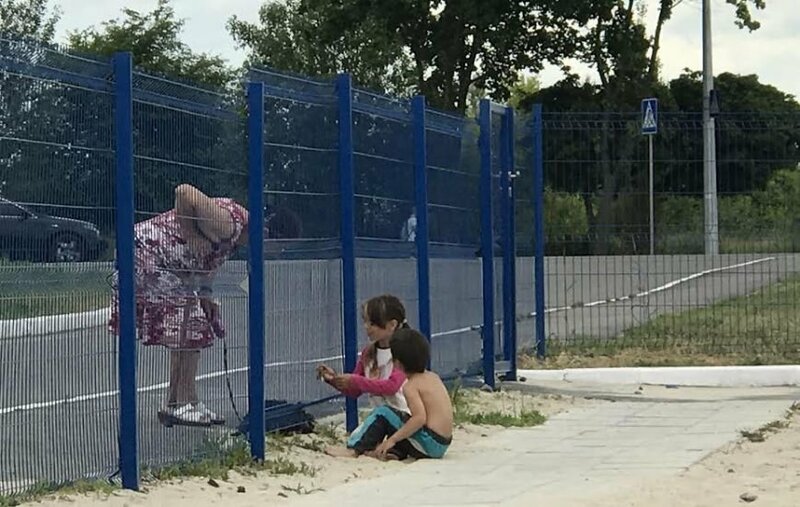 Yulia Konotoptseva regrets that the city authorities decided to allocate that place permanently to families who found themselves in difficult circumstances and families with many children. “At some point, the Ministry for Emergencies asked us to go in there and stay there on duty or set up a sort of an office of ours, because there were many problems I don’t even want to talk about. These problems still exist today,” she says. 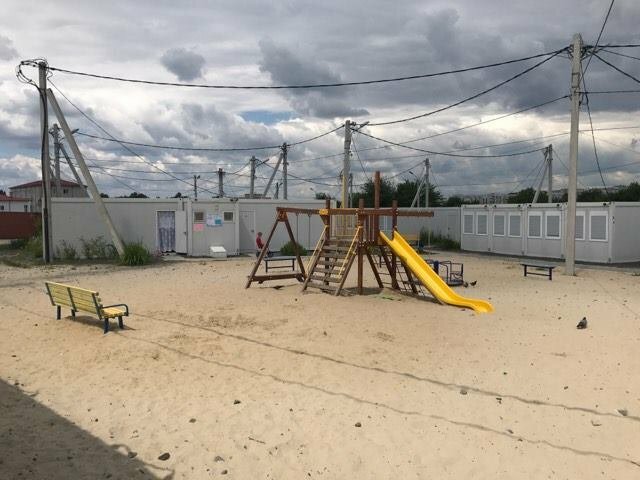 Station Kharkiv representatives visited the modular village a few weeks ago and saw that the living conditions there are difficult, yet people do not move out. “People don’t move, don’t develop, don’t want to help themselves; instead, they just wait for some program to open, and ask for help,” the volunteer says. According to Yulia Konotoptseva, she knows a family living in one room in the modular village’s dormitory, where the entire space is taken by a large double bunk bed. The room has no other furniture at all. But people are quite fine with the life like that. They are used to the life there, and do not want to change anything. They aren’t even deterred by a high rent. For 3.5 thousand hryvnias, one can rent a “mediocre” apartment in Kharkiv and a very good one in the suburbs. “Still, people don’t want to leave. That’s the phenomenon we do not fully comprehend”, Yulia Konotoptseva noted. Nevertheless, the majority of those who fled the war three years ago have already been able to fulfil themselves in Kharkiv. They found a job, a place to live and stopped asking volunteers for help. Some have even been able to realize startups. For instance, the IDP Maryna Popova opened a chain of Pchyolka hair salons in Kharkiv, the ex-Donetsk resident Illya Sandyrin created an advertising agency, and the IDP Valeriia Medianska opened Nasha Dacha store.